Lights. Camera. Action. It’s right there, do you see it? LIGHTS! 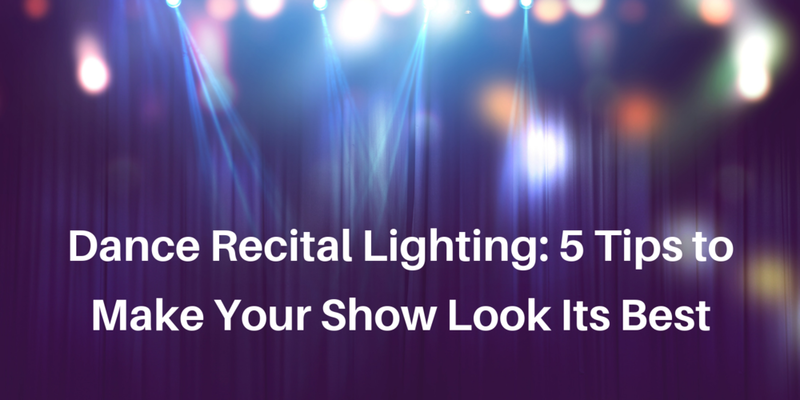 As one lighting professional puts it: "Light the stage so the performers can be seen. After that, there are really no 'rules' but perhaps a few concepts." It may seem obvious, but the audience comes to SEE the performers. And you want to see them on the video too, right? Well, even the best video cameras can't see as well as the human eye. Using low lighting to create a mood looks great artistically. Just consider that if the dancers can barely be seen by Mom & Dad in the audience, they'll likely be even darker on the video. Try to strike a balance between mood and long-term memories. Maybe low (or spotty) lighting isn't a conscious choice you're making as a director, but an unavoidable reality because of your venue. At some venues, if you're just relying on the overhead stage lights, your dancers may look perfectly lit AND too dark at the same time (see picture below). Solution? Ask the light crew to add or readjust the lights to even out hot-spots & shadows. If that's not possible, consider bringing in support. A few spotlights and, of course, a professional lighting crew can really transform the look of your show. Even in gyms, we've seen directors totally transform the viewing experience by using professional lights. Plan to dance on the wings of the stage? Down the aisleways? In front of the stage? If it's part of the show, do your best to light it directly. Ambient light from the main stage is rarely enough to see those areas properly, especially through the camera lens. Using a spotlight or other lighting will direct the audience's attention to those dancers during the show and ensure they're actually viewable on the video. As with most things, communication is key. Plan lighting cues with your light crew in advance and practice them during all rehearsals. Let the light crew know there will be a video crew, and pass contact information back/forth. Certain lighting effects like strong blue or red LED lights don't translate well on video and make the performers look like fuzzy aliens (see picture below). Clear communication with all the parties working on your show can help the production look its best live AND later. This one is more of a friendly request regarding the littlest dancers - from a mom who also happens to run a videography company! Every second our little ballerinas & princes are on-stage is a memory for Mom (and the rest of the family, too - but let's face it - moms are the most sentimental about this.) That means from the first beat to the last pose, lights should be up so parents can see every bit of their little one's stage time. We miss so much when the lights don't come up until 10-15 seconds into the song, and then cut to black on the last beat. Let it linger. Let them pose. We want to soak up every last second and then some!